We must realize that the basic purpose of counting physical inventory at year-end or twice a year is to verify the amounts stated on the perpetual inventory records and if no perpetual records exist, to calculate the final inventory amounts (as done on periodic inventory systems). However sometimes, taking a physical inventory count is very costly, sometimes impossible. Then, estimation methods are used to approximate the total inventory on hand to be reported on the balance sheet. One method of estimating on hand inventory is the gross profit method. It is most often used when an interim financial report needs to be prepared and on hand inventory number is to be derived. Other cases when it is used include when inventory is destroyed by fire or some natural disaster, and the amount of inventory destroyed in the catastrophe is to be estimated for insurance purposes. As an example, consider that IRA Corp. has a beginning inventory of $80,000 and purchases of $300,000, both recorded at cost. Sales at selling price amount to $400,000 and gross profit on selling price is 30%. 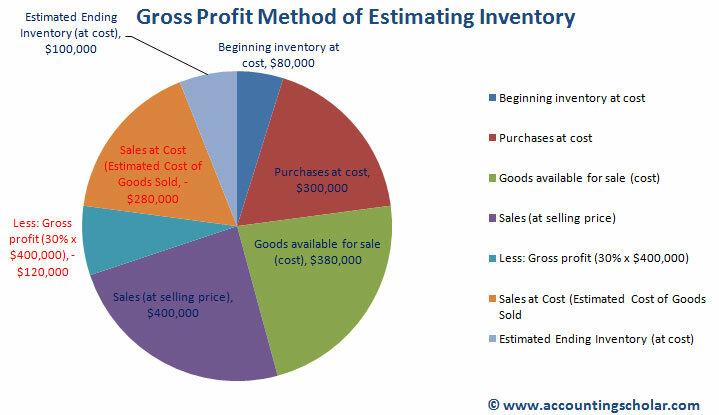 This chart above shows the breakdown of the costs included in estimating the inventory at gross profit method. The costs included are the beginning inventory costs, purchases for the year to arrive at goods available for sale, and the sales of the company less a gross profit of 30% to arrive at Sales at Cost (Estimated Cost of Goods Sold). This helps us finally arrive at our answer of $100,000 for the ending inventory.